With these new box sets we are celebrating the Camden compilation albums, released in the UK between 1975 and 1986. Although a product of Pickwick International , licensed from RCA Records, these albums are lovingly referred to as Camdens , simply because of the catalogue numbers and the big capital letters "CAMDEN" on the record and cassette labels. Despite often being dismissed by long terms fans when they were originally released, these albums were the first point of call for younger people getting into Elvis' music. 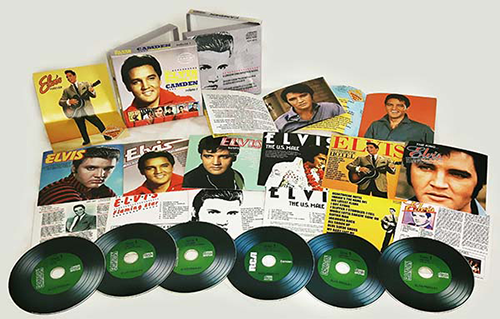 The budget prices, added to the eye-catching covers meant these were albums that found their way into many a home that had never owned an Elvis record. So, for many, there is a fondness for these releases. We hope you enjoy a trip down memory lane...with these Camden albums for the very first time on CD ! The Elvis Presley Camden Collection Vol 1. The Elvis Presley Camden Collection Vol 2. Seperate ways and the Camden release of You'll Never Walk Alone LP would have been excellent additions. The gospel album would have been a no brainer I would have thought.